The upgrade encompasses all aspects of the property, from guest rooms and cottages to function space and recreational areas. An extensive upgrade is underway at the Spruce Point Inn, in Boothbay Harbor along the scenic Maine coast, and is scheduled for completion before the start of the 2011 summer season. The upgrade encompasses all aspects of the property, from guest rooms and cottages to function space and recreational areas. To complement the physical improvements, Spruce Point Inn will also launch a new website with enhanced online services in early February. The inn’s website address is www.sprucepointinn.com. “We’re very excited about these upgrades, particularly because they focus on maintaining the unique character of the Inn and enriching the guest’s experience,” says Innkeeper Angelo DiGiulian. According to DiGiulian and fellow Innkeeper Joe Paolillo, the Spruce Point Inn’s guestrooms are receiving new furnishings and décor, common areas are being enhanced and new furnishings will be installed around the outdoor fresh-water and salt-water swimming pools. Function spaces accommodating social and corporate group clients will benefit from new décor and meeting technology. The Inn will also expand its mooring field and dock to accommodate the local and transient boating community. In the 2011 season, for the first time, Spruce Point will open its oceanfront deck for lunch, focusing on regional specialties including Maine seafood and locally grown produce for salads. “Overall, the upgrades will freshen the property and ensure we are offering the highest level of a traditional Maine experience,” says Paolillo. 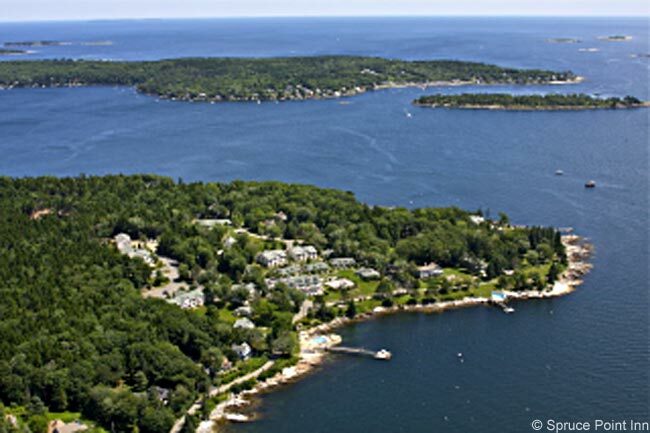 In operation for more than 100 years, Spruce Point Inn is located in the seafaring village of Boothbay Harbor, Maine (59 miles north of Boston) and situated on 57 acres of oceanfront and sheltering pine forest. The Inn is a retreat of 56 modern rooms in eight lodges, 16 classic cottages and rooms, 9 historic inn rooms and 4 townhomes. Its location, peaceful setting and spectacular coastal views have made the Inn a premier resort for families, reunions, weddings and business events. For reservations, call 800-553-0289. To find hotel deals in Maine, click here. Its good to always make such places nice and upgrade them, because this will reflect on the economy and tourism and jobs too! !